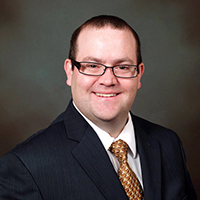 Jon has assisted clients in achieving their goals of homeownership and refinancing for the last 12.5 years. As a multi-year winner of the Five Star award for outstanding service, Jon’s top priority is to put clients at ease with the intimidating and unfamiliar process of obtaining a mortgage. Jon will help educate clients on the different types of loans and basic qualification requirements. Jon listens to client’s goals in order to tailor loan options that best help to achieve them. His expertise will help provide the guidance that is essential in today’s competitive market, and he uniquely understands how to manage the details of the process to help ensure an enjoyable experience and successful outcome. Jon works with clients from the time of Pre-Approval through Closing, and is always available to answer questions even after the loan process is finished. Jon was born in Latrobe and graduated from Greater Latrobe High School. He received a Bachelor’s degree in Marketing from Duquesne University and a Master’s Degree in Applied Business from Waynesburg University. Jon is a lifelong Western PA resident, currently residing with my wife and pets in the Monroeville area. Jon enjoys Pittsburgh sports, playing guitar, sampling local craft beers and anything related to Hawai’i.